When we meet new people, we’re tempted to ask: ‘what do you do?’ We’re picking up on the idea that our identity is very linked to our daily tasks. But the way the question is answered tends to lock on to the practical externals of our jobs. So a dental hygienist will explain how they keep plaque at bay; a corporate lawyer will mention a merger they’re engaged with that’s been in the news recently; a sound technician in a studio will detail how they rewire equipment, install new bits of routers and liaise with tricky ISPs around the world. 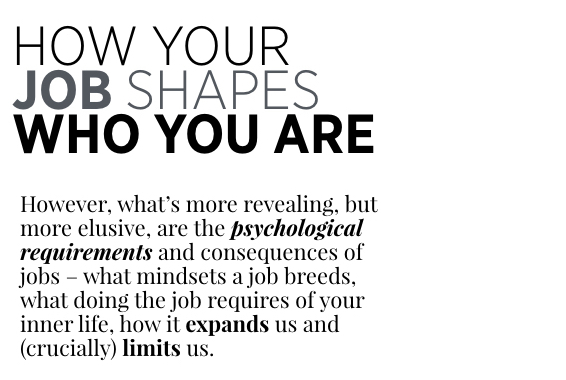 However, what’s more revealing, but more elusive, are the psychologicalrequirements and consequences of jobs – what mindsets a job breeds, what doing the job requires of your inner life, how it expands us and (crucially) limits us. Suspicious vs. trusting: does your work sharpen your sense that the real agenda might be quite different from the overt one? Are you in an environment in which people usually keep their cards hidden or outright lie (journalist, antiques dealer, management consultancy)? Or does your work generally involve you with people who are very upfront about their true concerns (psychotherapy, skiing instructor, air traffic control)? Dignity is fragile vs. a solid status: an artist is generally exposed to deep rebuffs; the things they have put their soul into may well be turned down or ignored. Even if they are pretty good at what they are doing, they may have no tangible public success. The eleventh best poet in the UK earned GBP 6,117 last financial year in royalties, advances, small grants and public appearance fees. Other jobs mean that reasonable application and ability is sure to be well rewarded: every bachelor of veterinary science is guaranteed a well-paying job. Better nature vs. worse nature: some jobs, however hard, continually remind you of the preciousness of life (palliative care, midwife) whereas in others you are always meeting the less admirable sides of human nature (police, family law). Logical vs. haphazard hierarchy: in some jobs, it’s clear what you have to do to move forward and how promotion occurs (airline pilot, teacher); in other jobs (television production, politics), the rules are a lot less settled and are bound up with accidents of friendship and fortuitous alliances. In the former, there is a calm and steadiness to the soul. In the latter, there is a constant anxiety – and lack of trust. Being in a declining vs. a growing industry: there are industries where it feels that the golden age was in the past; it’s probably less fun to be working in them now than it used to be (publishing, broadcast television, diplomatic service). Or is the whole industry growing, with all kinds of highly profitable new ventures emerging (social media, technology). Do you tend to work around people who feel they can conquer the world, or who sense that the world is about to conquer them? Being in a particular psychological environment every day for years has a pretty big impact on our habits of mind. It influences what we assume other people are like, it forms our view of life and gradually shapes who we are. The psychology inculcated by the work we do doesn’t stay at work. We carry it with us into the rest of our lives. We’re generally very aware that that can happen… in distant places. We understand that a French aristocrat in 1430 will have a particular outlook shaped by the fact that they have lived their life in a very strict social hierarchy, surrounded by a warrior ethic; or that someone from a 19th-century fishing village in in the Western Isles of Scotland, who has spent years battling storms off Benbecula, will have have a character profoundly marked by their working life. We are no different. The only difference is that we find it much harder to notice what has happened in our own case, because – of course – our outlook feels natural to us, though it is anything but. It may take an encounter with an alien (in the shape of someone from a very different field) to get us to notice. We can sometimes catch the effects of work on character in social situations. If you ask a solicitor, ‘what do you think cars will be like in 2035?’ they may be puzzled about why you would want to exercise your brain this way. What is the point of speculating about something currently unknowable? Obviously things will evolve in unexpected ways. But there will still be laws and courts and regulations. And we can deal with them when they arrive. If you ask an academic, ‘what are your earnings per hour?’ or ‘what’s the financial return on your investigations into the history of Swedish grammar?’, they will find the question tendentious. ‘Why are you asking? What does it matter?’ Though to you it may feel like an obvious point of enquiry. Or, if you raise with a commodities trader how their work benefits others the question might sound to them strangely naive: what would make you think the point of work was anything other than the personal advantage of the individual concerned? We’re broadly aware that the way people learn to think at work can be traced in their domestic and social character. The primary school teacher treats their children as pupils, the academic lecturer becomes a windbag at dinner parties, the politician can’t help making speeches as weddings. The technician is deeply calm and reassuring. Probably, they feel, all problems in life are a bit like the technical problems they have mastered at work. Most things can be put right, if you don’t panic and work your way down a checklist. The TV executive has a fragile sense of self. They are quite aggressive when they think they are on top, but fold quickly when they sense the wind moving against them. The dental hygienist becomes bossy. They are so used to having to upbraid people for being lax, it becomes a habit. The freelance writer, who is always having to grudgingly mould their work to the demands of others, becomes used to feeling misunderstood and under-appreciated. At work, the better parts of their ambition have to be subordinated: their piece on Venezuelan architecture gets sidelined but their advertorial on the fashion for pink diamonds has a ready market. They’re always expecting to be misunderstood, and become hyper alert to any signs this might be happening. Work can be very good for people. The mentality fostered at work might be making up for aspects of the self that didn’t get properly developed before. In an office where speed and accuracy are crucially important, someone who is slightly scatterbrained might acquire a corrective to their earlier weakness. An environment where compromise feels natural can be hugely educational for the person who has been over-invested in asserting their own views. But work can narrow our characters too. When a certain range of issues and ways of thinking become entrenched, it means that others start to feel awkward and even threatening. A person who has become very used to implementing the ideas of others – and maybe very skilled at it – can then find it deeply uncomfortable to be put on the spot and asked what they think the big objectives should be. They’ve got entirely out of the habit of asking themselves such questions. A school administrator might be very sharp when it comes to how you would reorganise the the personnel roster, but if you ask ‘what is education for?’ it sounds baffling, like asking what is grass for or why is London in England not in Scotland? Furthermore, something too moral and earnest might threaten the TV executive. Or an enquiry into their views on the French Revolution might might threaten a personal trainer. One feels that such questions are painful because they are reminders of what one has had to renounce in order to become focused on a particular job. By giving a large part of one’s life to a particular kind of work, one has – necessarily – not been able to life to do justice to other areas of potential. One has lost the power to engage with issues which might once have seemed intriguing. The general idea that work shapes us applies, of course, to oneself. But precisely because certain attitudes and habits come to feel natural, it’s hard to notice that this has happened. There’s a fundamental question we might ask ourselves: in what ways might my own character have been shaped (for better or worse) by my work (just as it is important to grasp how one has been shaped by childhood)? There’s a poignant autobiographical question: if I’d done a different job, would I have been a different person? And the answer must be yes. Contained within other career paths are other plausible versions of oneself – which, if contemplated, reveal important, but currently undeveloped, elements of one’s character. It gives rise to the most tricky of questions: where are those other bits of me…? Keeping in mind how work shapes a person means we should be slower to blame other people for the way they are. Perhaps it is their job, not ‘them’ that has made them as they are – that has made them so nervous, angry, or boring. It’s the employment environment we should blame, not them. The TV executive was not always like this, the corporate lawyer was not born as they now are. They might have been other people. Our identities are vulnerable to our jobs. And that may open the avenues of pity.